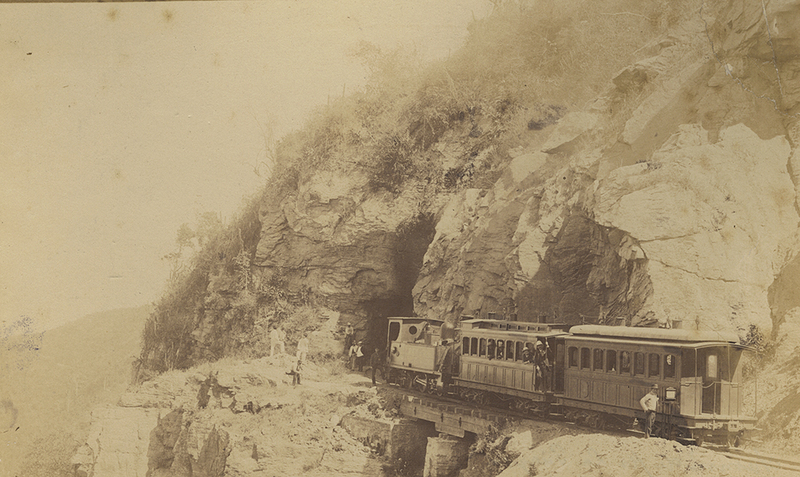 Caracas-La Guaira Railway in the XIX century. A few months ago we came across these images of the Caracas – La Guaira (then, La Guayra) Railway in a travel photo album. The construction of this line by the British began in 1881; taking two years to complete, the railway opened in 1883. After some research we found that a few of the images were created into post cards at the beginning of the 20th century. However, we never found a credit line or a clue as to whom might have taken these photographs in the 1880s/1890s. The image below shows the famous Boquerón pass, at altitude 2,021 ft, 12 miles from La Guaira. From this point train passengers could see 65 miles out over the Caribbean. All these photographs are vintage albumen prints mounted on board with their captions and/or titles hand written in French. If you want to read about the history of the Caracas – La Guayra Railway or any other electric transport in Latin America, you should click here. We welcome any help and other information you might have regarding these photographs: specific dates, photographers, etc. Remember that we accept contributions in Spanish, English or French. For further details please contact us here or here, or simply comment below. This entry was posted in Venezuela and tagged 19th century, Caracas, Ferrocarril, Fotografía latinoamericana, History, José Antonio Salas, La Guaira, Latin America, Photography, Railway, Siglo xix, Venezuela on March 19, 2014 by earlylatinamericanphoto. Espectacular estas fotos!!! nunca habia visto nada igual y tengo 48 años viviendo en la guaira.